How many times a day does the average homeowner use his/her kitchen sink? The number is quite staggering if we get into the numerics of it. And it is no surprise why. The household kitchen sink is one of the most versatile home accessories one can ask for. From food preparation to cooking, washing, and cutting, it can help you cover all essential tasks with ease. But choosing the right sink for all your culinary needs can be quite a daunting experience indeed. And if you’re looking for a sink that is not only durable but easy to maintain, then we have just the right choice for you. The Houzer Glowstone Stainless Steel Sink is a fantastic way to uplift the beauty of your kitchen and its sturdy build comes with excellent noise cancellation features as well. Let’s see if it can be your pick of the day as it was ours. What makes the Houzer Glowtone so unique? What about the Houzer let us down? If you are not all that new to the kitchen hardware scene, you must have heard about Houzer and their versatile range of products. The Houzer Glowtone is one of the latest additions to their unique lineup. Not only will it complement your home and your lifestyle but liven the kitchen, entertainment area, and the lavatory as well. The Houzer Glowtone is a perfect representation of Houzer’s passion for unique sink design and an ideal way for you to give your kitchen that much needed personal touch. Let’s see what makes the Houzer Glowtone so popular with the average homeowner. Don’t you have a sinking feeling when the expensive sink you buy breaks down in a matter of months and starts to corrode? Houzer Glowtone, on the other hand, lives up to all its expectations and more. It is made from durable, type 304 stainless steel that makes it amazingly sturdy and durable for years to come. 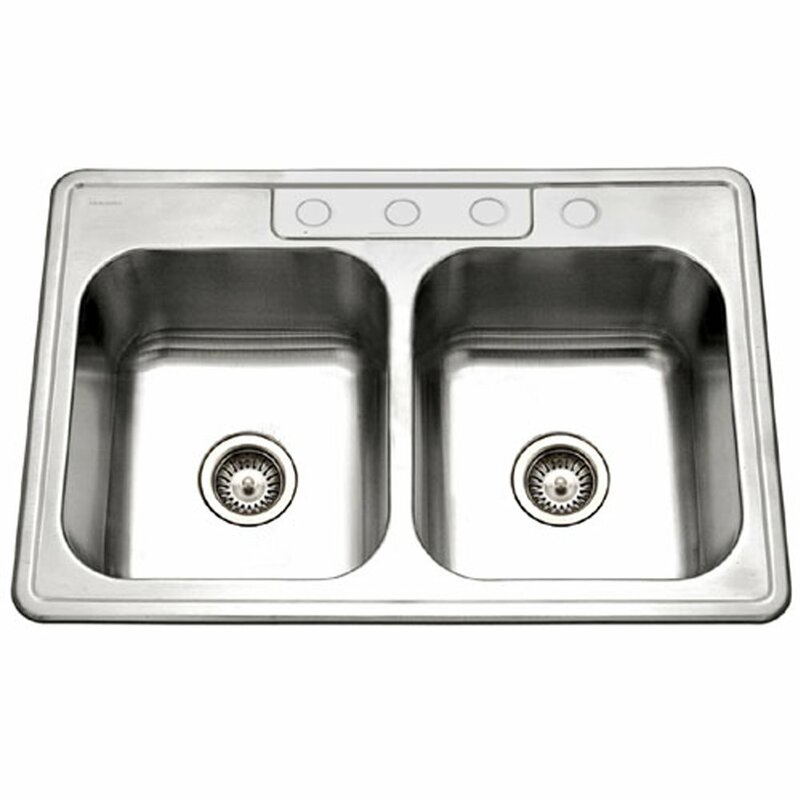 The type 304 stainless steel is an ideal mix of nickel and chrome that keeps the sink highly resistant to corrosive chemicals as well as making it stain free. The hygienic, scratchproof and resilient surface of the sink doesn’t require much care and maintenance. It is easy to clean and even more comfortable to set up and comes with a lifetime warranty to the purchaser against any possible defects in materials and workmanship. 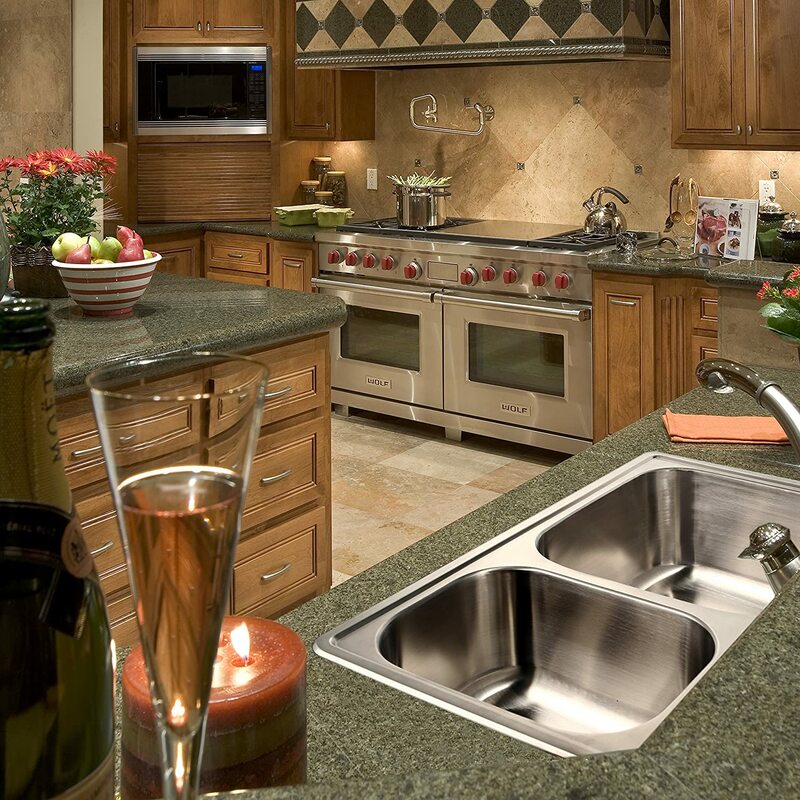 Stainless steel is very versatile and can be used to fit almost any kind of style you’re looking for in your kitchen. It is effortless to clean and doesn’t require any harsh chemicals or non-soap cleaning agents. It doesn’t allow bacterial accumulation as well. The Houzer Glowtone is also equipped with a Super-Silencer pad that is made of natural rubber. This rubber pad acts as a fantastic buffer that absorbs the noise from cluttering dishes and running water. Quite ideal for homes with noise sensitive people who are easily disturbed by the slightest sound. It also comes with a marble powder based undercoating called StoneGuard protection, which in our eyes is one of its best features. This undercoat multiplies the noise reduction capabilities (when coupled with the silencer pad) and even helps in thermally insulating the sink. The thermal insulation keeps the water hot for an extended period of time which in turn greatly helps in removing the most stubborn stains off of dishes. When trying out the Houzer Glowtone, what we noticed is that its stainless steel build is quite prone to water stains if not dried properly. Fingerprints were also noticeable along the border of the sink which was not easy to remove. Scratches will also develop over time with extensive use. While it is versatile in matching your overall decor, stainless steel will always look like silver and may not be suitable to match your bathroom aesthetics. The Houzer Glowstone Stainless Steel Sink is as versatile as it is affordable. With its corrosion resistant build, amazing durability and noise reduction, it is one of the best sinks at its price and comes with two thumbs up from our side. Hope we were able to bring you an informative review today.